This is a screen capture of the Jing video launch for my tutorial. Click here for the tutorial. 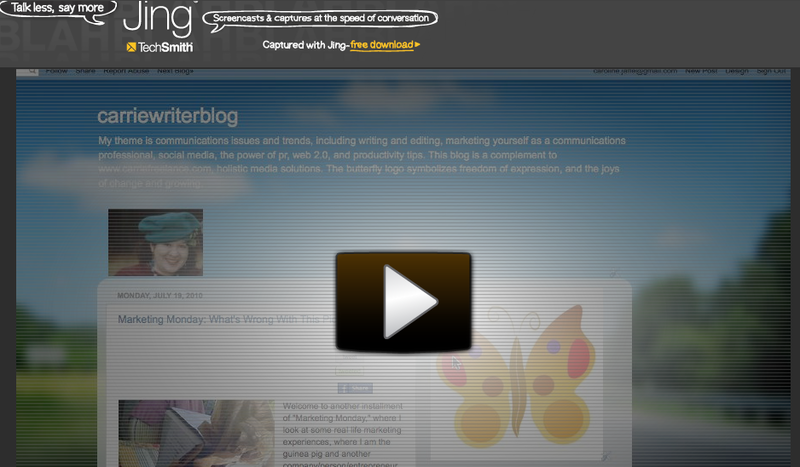 Welcome to my first screencast! I had a great time preparing this little tutorial on one of my favorite topics -- widgets! Here, I show how to easily add a YouTube widget that will show your channel in the Blogger sidebar. The reason I chose this particular widget is that there are some setting that pop up on the menu options that can be confusing. For example, if you leave the "keyword" options in, other videos will load in addition to or instead of yours, and you won't be showing off your videos. This might work if you are wanting to show your favorites, but if you are creating video content like I am, you're probably going to want to share that first. *I found the program fairly easy to use, in that it was only about 15 minutes between the time I downloaded it to when I started preparing my tutorial. It was simple to crop the area I wanted on my desktop to become the screen, and the control panel of choices was straightforward: capture video, images, save to hard drive, save to screencast.com. *I loved the customized buttons you can create on your control panel to automate sending files to Twitter, Facebook, and Flickr, and I'm going to test them out next. I also did something that was probably advanced for a first go-around, and created a "Screencast Embed" icon that would produce HTML code right away. Woohoo! *The tutorials are numerous, clear, and to the point, and the voiceover is a pleasant speaking voice. I really enjoyed them and clicked on then a lot more then I have in other learning situations. *You cannot upload directly to YouTube unless you upgrade to a PREMIUM account, which was about $14 a year. Without that option, you are left to get the embed code from the screencast program, and it was a awkward to retrieve it. I had to keep going back to the video to upload it again and get the code. A simple pop up widget would have helped a lot in this regard. Even when I did get the code with a test video, I had to go into the HTML to change the size of the video and other details that were a bit complex for the average user. *Audio. My iBook is a few years old and the built-in microphone is not that great, however I have used it with iMovie and it's worked OK. The audio, as you can probably tell, is not great, but if I were to create a lot of these I would definitely get a separate microphone anyway. I did find it odd that there were not any options for equipment add-ons in the audio department? 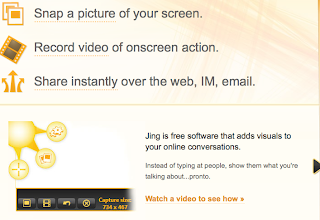 Overall, I would definitely recommend this screencast program. Comparing it to one other that I tried, Screentoaster, it was infinitely better, both in terms of image quality and sound. Screentoaster does have a new improved version in Beta, but I tried it on a test video, and the video image came up distorted and pixelated. So that's the end of that, for now. Interested to hear your experiences with screenrecorders and favorites you might have...blog on!